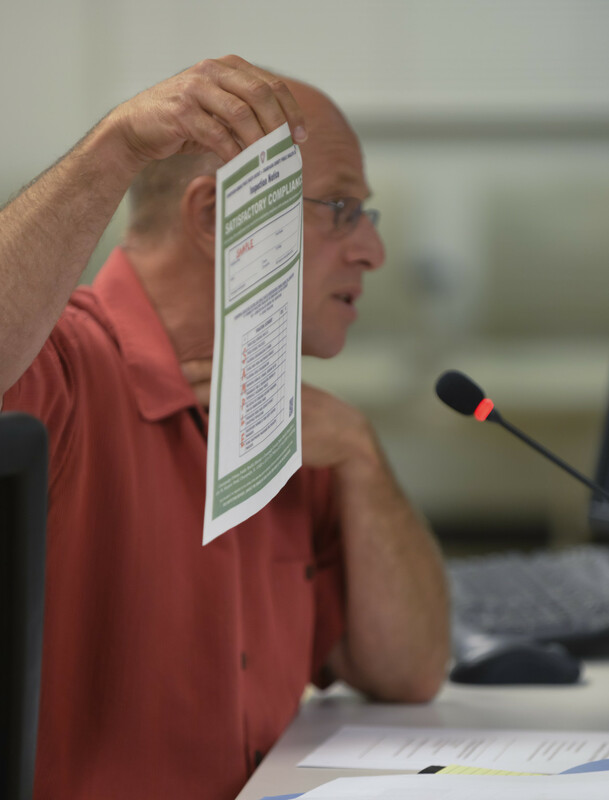 Jim Roberts of the Champaign-Urbana Health District holds up a sample placard as county board members discussed whether restaurants in the county should be required to display inspection placards on August 21, 2014. Instead, Illinois next year will adopt the Food and Drug Admistration’s most recent update to its Food Code, published in 2013. The changes to the code were made to reflect violations that are more likely to make people sick, local health officials said. “The new code takes and prioritizes violations based on their historical attribution to food-borne illnesses,” said Doug Toole, administrator of the Vermilion County Health Department. Currently, code violations are critical and non-critical, but the new violations will have a new language. They will be called priority, priority foundation or core, said Jim Roberts, director of environmental health for the Champaign-Urbana Public Health District. A priority item is an item that directly reduces risk and, priority foundation items are items that allow priority items to happen. Core items are other items that don’t fall in these categories. For example, a priority violation would be an employee not washing his or her hands, a priority foundation violation would be not having soap, while a core violation would be the sink being blocked by a bucket. The new Illinois Uniform Scoring Guide proposes that health departments use two types of violations to penalize restaurants: risk factor violations (ones that are proven to make people sick) and repeat violations. However, the guide is non-binding, and counties decide how to apply the code on a local level. “All the challenges are local. We can have all different kinds of enforcement,” Roberts said. Local health departments are still figuring out how they will change their processes to reflect the new food code. Vermilion County will no longer issue grade cards that show the results of the last routine inspection, Toole said. “Once this new code has been placed into practice and the department inspectors have become more adept to the changes, this department may be in a better position to create a method to replace the current grading system to better assist the public to know how a food establishment has fared in their most recent inspection by our department,” Toole said. Roberts said that he isn’t yet sure what scale the Champaign County health department will use to determine whether restaurants should pass or fail. The department has a website to inform the public about the new changes, including a draft new inspection form. Roberts said he hopes the new system will be in place in January, though the department has until July 2018. Roberts said that the new system will be more effective because the current scoring system is largely arbitrary and is not an effective tool for determining restaurant safety. Roberts asked the public to reach out to him with feedback at eh@c-uphd.org.